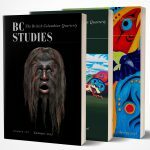 The BC Studies Annual Online Auction will be taking place from November 23rd through 30th. For news and teasers of some of our fabulous prizes, stay connected with us on Twitter or Facebook. Check back in late November for a link to the auction site and to make your bids! BC Studies thanks you, and all of our auction donors, for your generous support.